Just down the mountain from San Agustin was Caripe. It is known as the "Garden Of The East", which sounds a whole lot better than the translation of the word "caripe" which means "River of Squirrels" in the Caribe language. I didn't even know squirrels could swim. I didn't see any of them (maybe they CAN'T swim) while I was there, but I also didn't know what the word meant. Had I known I would have been looking for them. 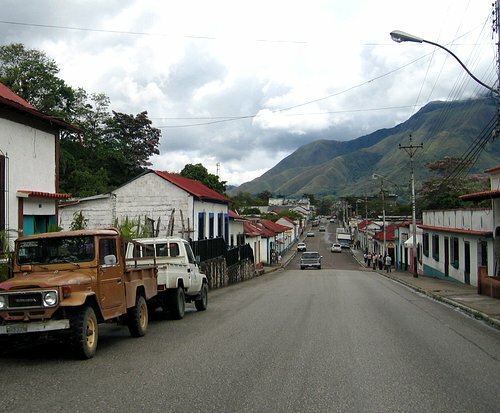 The town sits in a valley of the Turimiquire Mountains which the Rio Caripe runs through. 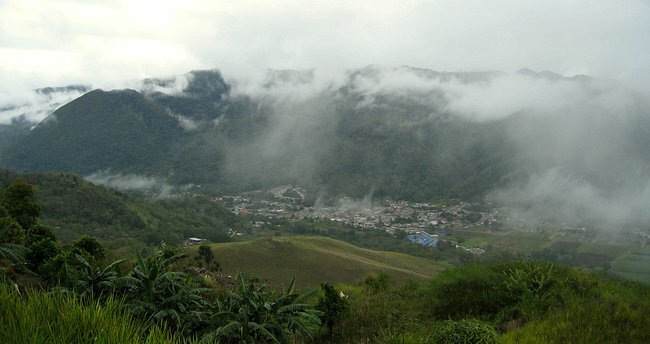 The Turimiquire mountains create a unique collection of climates that are quite different from the rest of eastern Venezuela. In general the mountains make the region cool and wet. 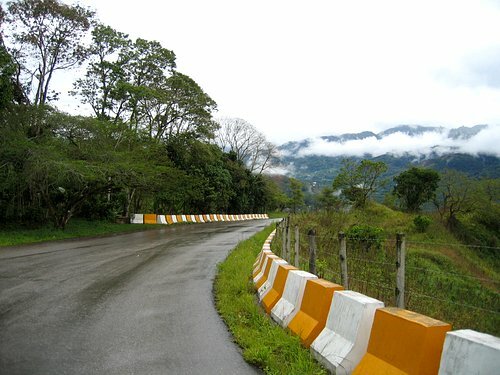 Below is along the road that comes down the mountain from San Agustin. The climate, and the fertility of the ground makes plants such as orange trees, various vegetables, strawberries, flowers like violets, orchids and roses, practically grow wild. Below is the east end of Caripe. The town has about 12,000 people, so it was a nice size. It was founded in 1717 by Father Simón de Yabar. It was later destroyed by the Caribe Indians, but then reconstructed in 1734 by the Capuchin Father Pedro de Gelsa. We really only spent a small amount of time in town and most of that was at the Internet Cafe -- when the electricity was on -- but it seemed like a nice town. I did not get to go -- someone had to keep working -- but near Caripe was the Cueva de Guácharo National Park. The cave (cueva) is the largest known cave in the country and is over 10 kilometers in length. It is also home to one of the largest known colonies of the guácharos or Oil Birds (or steatornis caripensis if you speak Latin). It is a nocturnal, fruit eating, dark grey-blue colored bird that grows up to 60cm in length, and has a wingspan of 110cm. They look like a hawk. The guácharos are unique among birds in that they have the ability to navigate using high-pitched squawks for echo-location like bats. Guided tours of the cave only go in about 1500 meters. Alexander von Humboldt, the European naturalist whose name is known all over the world, visited the cave in 1799. The monks told him, that the local Indians hunted the birds for their fat deposits. 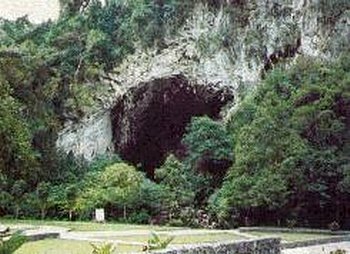 In the summer the Indians entered the cave with long poles and destroyed most of the thousands of nests that lined the roof of the cave. The young birds were killed and stripped of the layer of fat between their thighs, which was melted in pots and filtered to produce a clear, odorless liquid. Superstitions prevented the Indians from going very far into the cave, and the birds were hunted only once per year, which is what probably made it possible for the colony to survive. Humboldt's tour only went into the cave about 500 meters. 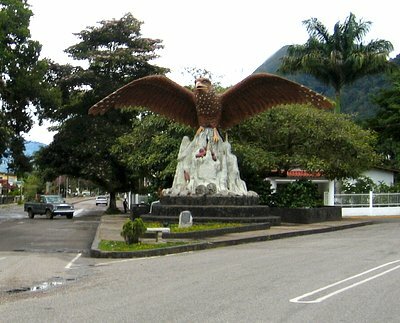 A large statue of a guácharo is in Caripe where Avinida Guzmán Blanco and Avenida Enrique Chaumer meet at the west end of town. 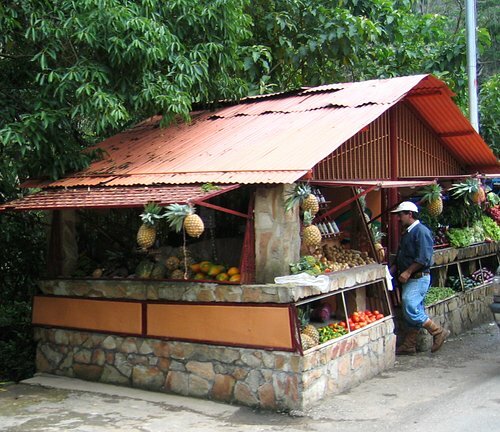 There is an abundance of fruits and other plants grown in the area. There are stands like this all over the place.